This final post about the STAN platform will specifically focus on data visualizations that can come from STAN models. In particular, we will explore these visualizations by hand with the popular shinystan package. As we already know, the STAN platform typically uses particular Markov Chain Monte Carlo (MCMC) algorithms: the Hamiltonian Monte Carlo (HMC) or the No-U-Turn sampler (NUTS). It is also typically more efficient than other popular samplers, such as the Gibbs sampler or the Metropolis-Hasting algorithm. This is due to updates of the posterior converging more quickly to the stationary posterior distribution. introduction with rstan, with rstanarm and with bayesplot. Now, the goal is to use all learned knowledge from before to build a shiny application through the shinystan framework. Several vignettes are available for the shinystan package: For examples, see here or here for the deployment to shinapps server. The solutions to this set of exercises can be found here. In order to have a first visualization of the structure of a shiny application from STAN, run the demo app of the shinystan package. This demo app comes from the “Meta analysis” chapter of the STAN manual. You can also see it in this rstan vignette in the example section. We want to simulate data in order to build our own shiny application with the shinystan package. We will take the same kind of examples in the previous set of exercises (see exercises with the “Bayesian inference” and “MCMC” tags) with the two-parameters Gumbel distribution coming from the Extreme Value Theory. This kind of posterior distribution is often hard to evaluate, hence why we need MCMC samplers. Simulate a sample size of 100 from a Gumbel distribution (relying on the evd package) with location and scale parameters set to 10 and 3, respectively. – The parameters block: mu and sigma (cannot be negative) that represent the two parameters of a Gumbel distribution that we will have to estimate. – The model block: defines the prior distribution for the two parameters: weakly informative centered on their sample estimate, for example, the empirical mean and the empirical SD of the sample with a variance of 25. Then, create the vector of interest from these two parameters. – The generated quantities block: defines the posterior predictive values (y_pred) from the model. Do not forget to constrain the upper and lower bounds in the data and parameter block declarations. Note that it is recommended to write the STAN code in a separate file (“.stan” extension) and then call it directly through the stan() function instead of writing it in a character string, as done here. That would be easier to debug, read, etc. Define the named data list that will be used inside the STAN data block written above. – A warm-up phase of 200. This phase defines the number of iterations that are used by the sampler for the adaptation phase before sampling begins; it is different than the burn-in phase we have seen in the Metropolis or Gibbs samplers. 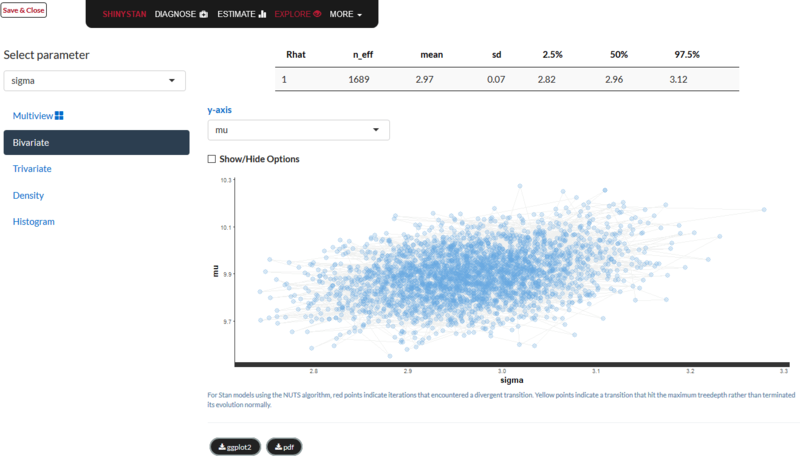 Now, launch the shiny application that will allow you to have full access to the MCMC visualizations and diagnostics. Specify that you want to visualize the application in your own Rstudio viewer pane. Now, do the same as Exercise 6, but by viewing the application on your localhost directly in your default browser. c. Do a Trace-plot for the scale parameter with the 4th chain only. Moreover, take the log10 transformation of this parameter. d. Find the standard deviation summary of the sampler parameters. Include the warm-up phase and display 3 decimals. e. Check the effective sample sizes, the monte-carlo standard error and posterior SD, and the Gelman-Rubin Rhat. Set the warning levels to 50%, 15% and 1.01, respectively. f. Compute the Partial Auto-correlation for every chain and for every parameter. (HINT: check the “Show/Hide” Options.) Then save the plot as a pdf. After that, close the app. a. Compute the 95% and 70% posterior intervals for the parameter sigma. Include an indicator of the Rhat (Gelman Rubin diagnostic) in the plot. b. Display the summary table of the parameter estimates. Highlight the scale parameter and order the table by effective sample size. Then, download the table. c. Finally, go to the “explore” tab and check the bi-variate plot of the posterior draws of the two parameters. Since this feature is still experimental, some bugs may still appear. You need to use the “PPcheck” tab and relaunch the app on your browser. It will check if you have both the predictive posterior samples and the sample data in a good format.